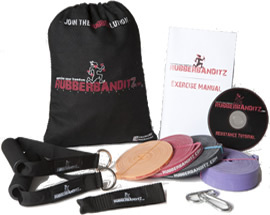 Rubberbanditz specializes in mobile fitness equipment kits featuring resistance bands. The gym-in-a-bag kits include circular exercise bands with varying levels of resistance, hand grips, a door strap, and instructions. Everything comes packed in a convenient carrying bag, making the kits perfect travel exercise equipment. Whatever your chosen form of exercise – including high intensity interval training (HIIT), CrossFit, powerlifting, pilates, or yoga – Rubberbanditz can help provide a full body workout on the run. Great for home use, hotel rooms, or outdoor workouts.